Just a quick posting to show you a layout I worked on last week for the February LCOM “ScrapCapture”….we were presented with one of Donna Downey’s beautiful layouts and asked to “Capture” our take on it! 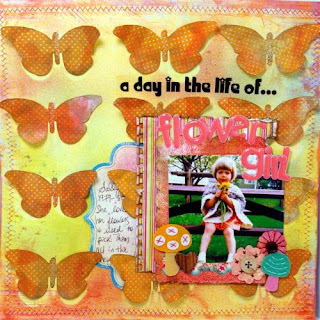 Lots of Butterflies, Glimmer Mist and Ranger Distressed Inks on this one, Pink Paislee papers, a few Sassafras Felties and one of their very vintage stickers! Each butterfly was handcut (I traced from a Scenic Router Chipboard piece) and then sewed them on one by one in their centers…that way they can flap their wings!